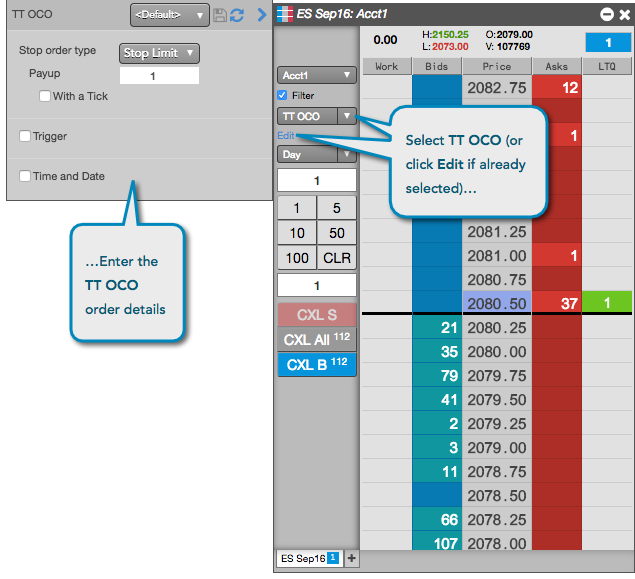 You can enter a TT OCO in either MD Trader® or the Order Ticket. 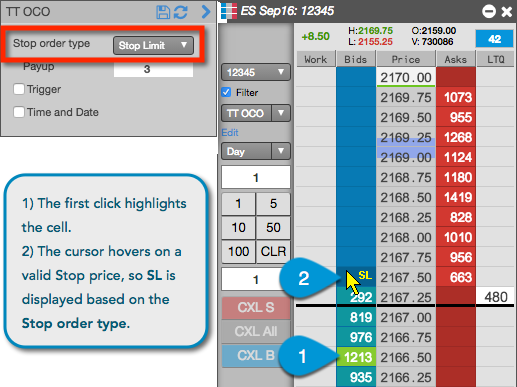 In MD Trader, you have to click at two different price levels in the price ladder on the same side of the market to enter the OCO. The first click in the Bids or Asks column highlights the cell at a price level. As you move the cursor to a different price level, the cursor will indicate whether you are entering a Limit order or Stop (Stop Limit or Stop Market) order at a valid price. 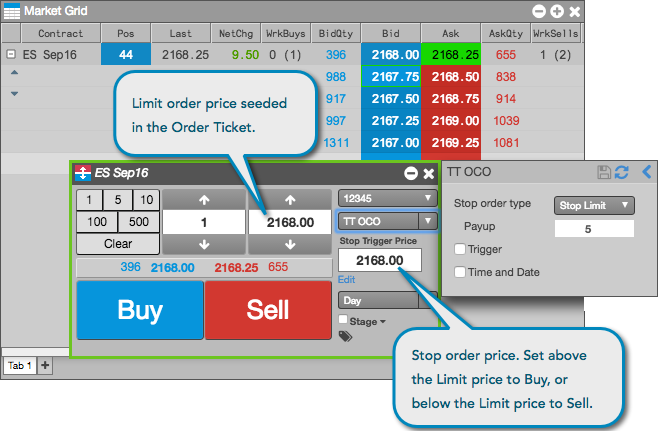 In MD Trader, the cursor also indicates if the second order of a TT OCO order is not allowed. When you hover at the same price as the first click, the cursor displays as "not allowed". For a Buy-side OCO order, if you hover below the first click, the OCO order views the first order as a Stop order and validates the price of the Stop against the current last traded price (LTP). If you hover above the first click, the OCO order assumes the second order will be a Stop and validates the price of the second order against LTP. 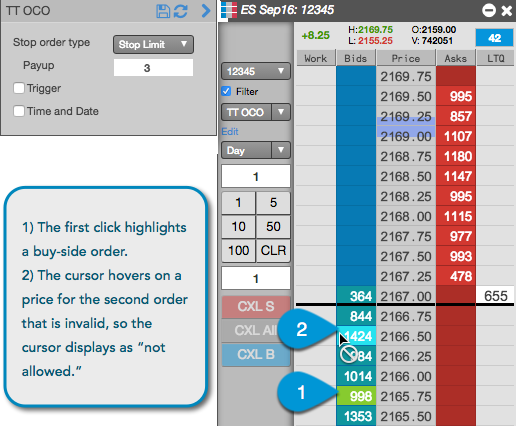 For a Sell-side OCO order, if you hover above the first click, the OCO order views the first order as a Stop order and validates the Stop order price against the current last traded price (LTP). If you hover below the first click, the OCO order assumes the second order will be a Stop and validates the price of the second order against LTP. Open the MD Trader® widget. Select TT OCO for the order type. Enter the TT OCO parameters. Select an account or use the default account. Specify the TIF for the exchange-native child orders submitted by the TT OCO order. Click in the Bids or Asks column at the first price level of the TT OCO order. Click in the Bids or Asks column at the second price level of the TT OCO order. 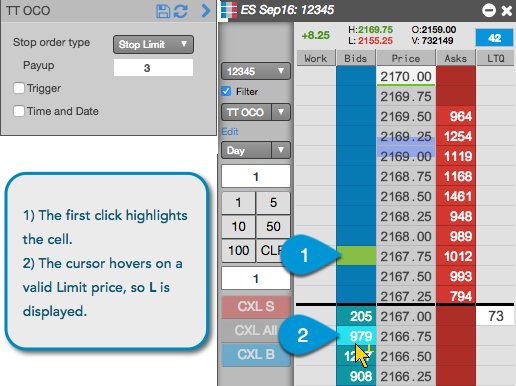 Depending on the first price level and side (Buy or Sell) of the first order, the cursor indicates whether a Limit (L) or Stop (SM or SL) order is allowed at the second price level. The cursor also indicates at which price levels an order is not allowed. In the Order Ticket, use the Stop Trigger Price field to set the price of the protective stop order. The Limit entry price is seeded in the Order Ticket. For an OCO Limit order bid, the OCO Stop order can only be placed above the OCO Limit order bid. For an OCO Limit order ask, the OCO Stop Limit order can only be placed below the OCO Limit order ask. Enter the TT OCO order quantity and price for the Limit order. Set the price of the Stop Limit or Stop Market order in the Stop Trigger Price field. Set the Stop price above the Limit price to Buy, or below the Limit price to Sell. Click Buy or Sell to submit the order. If you cancel one of the child orders submitted by a TT OCO order, the other child order and the parent order are also canceled.